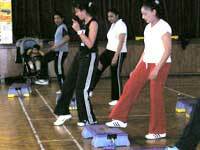 This is a basic step class, with very easy steps that everybody can enjoy. It features a Latin approach to step, with easy combinations, Latin music and great fun. The music and dance is from all over Latin America inspired by Rumba, Salsa, Latin Jazz, Tango, Samba, Afoxes (from Salvador de Bahia) etc. I adapt the class and create choreography as we go along, to suit the group. 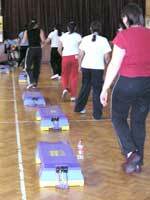 Adapting these steps into a step class makes the class rich in movement and fun. The steps are easy to begin with, but we build up slowly towards a high cardio routine; so by dancing we burn lots of calories!!! On the other hand, it's also a good class to improve self-esteem, this is just one of the wonderful effects that dance has on us. We have been dancing ever since we have been on this planet: to celebrate, to ask the Gods for help, to show who we are, to be happy, or for sorrow.